As if there aren’t enough rules on Passover, I’ve added one more. This one, though, makes the holiday a lot more pleasurable (and digestible! ): I won’t make or eat anything on Pesach that I wouldn’t enjoy eating during the rest of the year. That said, my plan for the next few weeks is to include posts that are kosher and yummy for Pesach and year-round. 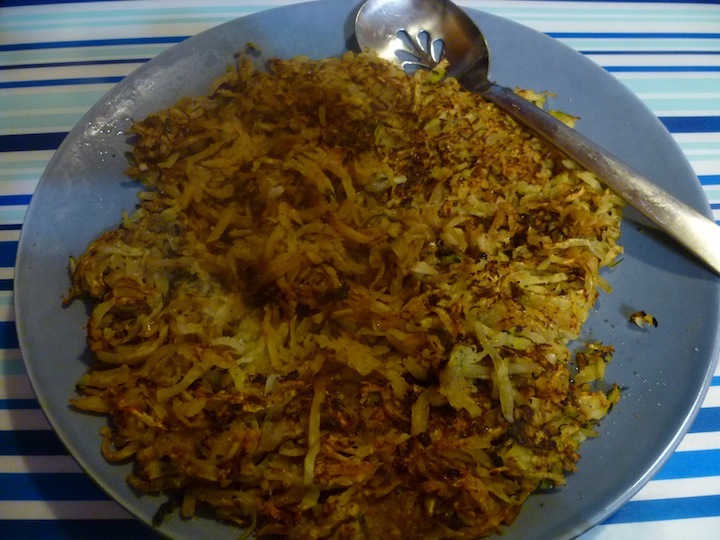 While hash browns are always a crowd pleaser, fried potatoes aren’t necessarily my first choice for healthy and easy vegetable dishes. 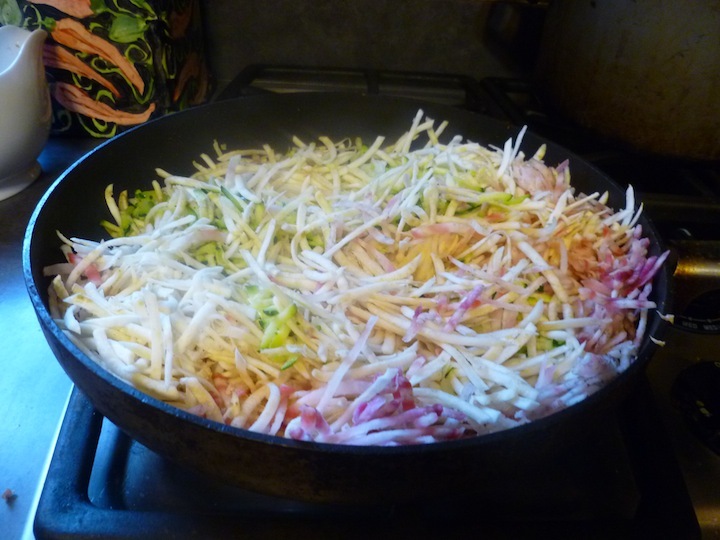 But with a little tweaking, grated root vegetables is a lot easier and as tasty as hash browns. Made as one giant pancake, there’s not much need for a lot of oil either. With a food processor, this recipe takes minutes. You can even make it one handed while holding a phone…or say, a baby, in the other. Use any root vegetables you have in stock and experiment with different combinations. Grate all vegetables and onion and garlic in a food processor. Heat oil or butter over medium-high heat. Add vegetables and stir for a few minutes. Spread veggies evenly in pan and let it sit for 5 minutes. Flip it to brown the other side for another 5 minutes. Continue until desired crispiness. Add salt and pepper. this sounds like a great idea. I want to forward it my daughter–she’ll be doing most of the Pesach cooking. Hope she has food processor!